For decades, the Wholesale Beer Distributors of Texas has published a monthly report analyzing beer shipments into the state. This report begins with a summary of the entire state’s beer by volume, by brand, and by package. The report also converts the brand totals into barrels. Obviously, this is a pretty handy report as it provides a clear indication of volume rankings, who is hot, and who is not. Talking points, if you will. The remainder of the report is categorized by distributor, not by market. The report does, however, list distributors by the city in which the distributor receives the beer. In the 1980’s, as Coors expanded into Texas, the brewery appointed four Coors distributors in San Antonio and five distributors in Houston. In San Antonio, these four distributors competing against one Budweiser distributor, one Miller distributor, and one Schlitz distributor, in addition to several other distributors including a Pearl, a Lone Star, and a Falstaff house. Acquiring accurate shipment numbers reflective of one’s standing in the market, obviously took some creative accounting. The one-house operations typically had only one county to service, however, all the Coors houses had a part of San Antonio, plus to three to four more counties outside the city. Therefore, one had to attempt to line up counties as best as possible. Certainly not a perfect system, but it worked. The Wholesale Beer Distributors of Texas was published monthly, along with other industry publications, including Modern Age Blue Book and Beer Marketer’s Insights published on orange paper. At the time, these were the only publications reporting on the industry. In the 1960s, and into the 1980s, there were still a number of very small beer distributors in the state. Almost all were in rural counties, producing small volume, so at times, these small distributors had no beer shipped to them, and thus, there was no report. By the end of the 1980s, most of these small operations had been purchased by larger distributors. For years there was only one Hamm’s distributor in the state, a very small operation in Mission, Texas. In addition to owning the distribution rights for Hamm’s, the distributor in this little southern Texas town, also sold Femsa products, mostly Carta Blanca and Tecate. The town of Mission is on the Rio Grande River, a Mexican border town, and a seasonal destination home for many retirees during the winter months. Because many of the retirees were from the upper mid-west, there were a plethora of Hamm’s consumers in Mission during the winter months. All of which is surprising considering that these old, small, operations are the forerunners of today’s start-up craft/import distributors! Today is the last day of this year’s National Beer Wholesalers Association convention in Chicago. As is the norm, most attendees are AB or MC operations and suppliers. While attendance is around 2,000 people, the beer industry saw 12,000 present at May’s Craft Brewers Conference; a huge difference in attendance between the two conferences. The distributor tier could now be experiencing the same growth as the craft brewers have enjoyed. The number of distributors operating today is growing, as more and more, highly focused distributors open representing only the crafts segment of the market. These operations are experiencing the same issues as craft breweries: undercapitalization, lack of knowledge, shortage of experienced professionals, logistic and operational challenges. As with craft breweries, those companies that are aware of their weaknesses, and work to improve them, will be successful; while those that do not recognize their weaknesses, they will die out. Some will grow, some will sell, and others will fade away, but these start up craft distributors are here and growing. Soon there will be new faces at the annual NBWA convention and we will not know them! Across professions, consistency is a direct product of work ethic…. We are not retreating – we are advancing in another direction.. There is the saying: “Those who do not learn from history are doomed to repeat it.” Such is the case in the beer industry, but not necessarily in a negative way. We see history repeating itself in the birth and incredible surge of craft beers, aided, of course, by the internet and social media. Go back in time to the years immediately preceding prohibition. Tied houses aside, the industry had thousands of breweries across the U.S. Similarly, today, we have 4,000 breweries and the trend shows no signs of slowing. Those breweries 100 years ago were local breweries, serving the community not just with beer, but said breweries served as the social gathering place for locals. Often these breweries serviced their patrons more along the lines of segregated establishments based upon the nationality of those in the region. History is repeating itself as the local flair is back, bigger and better than perhaps anyone could have predicted. Every industry publication, distributor and even breweries say the same thing: Local is in, regional, and some national brands, are out! After the end of prohibition and the end of WWII, many of these successful local breweries made an attempt to expand outside of their local footprint, some even building breweries in other states. One such example came from the state of Texas, when a local brewery decided to supersede its state boundaries and built a brewery in Oklahoma City. One by one, these out-of-state breweries failed for a myriad of reasons, many because they simply could not compete with the big domestics beers. We all know the story. To some extent, this is happening again. Just last week, St. Arnold’s, the oldest surviving craft brewery in Texas, announced it was leaving the state of Florida and instead has decided to focus sales and marketing efforts only in the states of Texas and Louisiana. What makes this decision interesting is that the feedback from St. Arnold’s Florida wholesalers was that the brewery had done everything by the books. St. Arnold’s hired the right people, made the right chain calls, priced the beer right, focused on the right marketing strategies, and had plenty of feet on the street, yet St. Arnold’s could not get the traction to match their efforts. 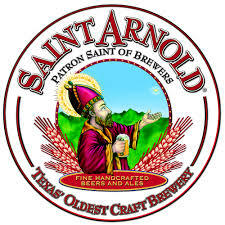 Now St. Arnold’s is upping their efforts in their own backyard. They are going back to the basics, often referred to as the “300-mile rule,” which states that it becomes difficult for a brand to establish itself competitively against local brands, if said brand is 300 miles outside the radius from its home brewery. In some sense, there are markets and states, including Oregon and Colorado, where breweries are like Starbuck’s: one on every corner. And in some instances, there is extreme pull-back. For example, Grapevine Brewing in Grapevine, Texas, just pulled all their packages and kegs out of the market, deciding instead to sell beer only at their brew pub, located in their new facility, and in their beer garden. Some may say that this pull-back is a breweries’ last attempt to survive, and while this might apply to a brewery like Grapevine, it does not apply to St. Arnold’s. St. Arnold’s move could be defensive maneuver to combat the growth of Karbach and other Houston area breweries. Either way, expect more and more breweries to limit expansion or retrench. We are not retreating…we are advancing in another direction! Shortly after Jerry Jones purchased the Dallas Cowboys he sold the beer concession rights to Texas Stadium. What was unusual about this deal was that Texas Stadium, at that time, was not part of the Dallas Cowboys, because the NFL had a sponsorship with AB. When Jones sold the rights, the football team was experiencing several back to back losing seasons, having won just one game in the recent season. The price was reported to be one million for stadium rights. Initially, Coors turned down the sponsorship right, but Miller jumped on the opportunity. The rest is history, including the fact that the Cowboys are now in AT&T stadium and Miller continues to hold the concession rights. As a side note, Miller’s purchase of the sponsorship rights in the early 90’s, fortunately for the distributor, coincided with the Cowboy’s ride to three Super Bowl titles. The beer sponsorship also includes The Star, the new, state-of-the-art, Cowboy practice center, along with signage, the Cowboys preseason camp, etc. It is close to impossible to find any brand other than Miller Lite in AT&T stadium. Not a bad investment for Miller! Professional sports sponsorships are nothing new. As the NFL grew in popularity, so did the rising costs of sponsorships, but measuring the overall effectiveness of said sponsorships on market sales is, at best, challenging. Wholesalers benefit when their supplier obtains the rights to sponsorships. The benefits include not only direct sales, but also the the spill-over effect into the wholesalers’ market from the leveraging of tickets, events and other activities with the team. It is hard to beat that kind of excitement. The industry is changing rapidly, including traditional media methods of marketing. In the craft world, social media has become the media giant of this segment of the industry, in many ways, defining crafts. The craft industry owns social media, live social media and depends upon social media. While all beer companies use social media, social media is the life blood of the craft industry. So the question for the major breweries is how can they effectively market their products? Especially, how can these major breweries market their product to the young consumers who are cutting the cord for cable TV. So far, traditional marketing has not worked, nor have their efforts in social media. Numbers do not lie. ABI might be forced to produce a radical marketing strategy that can truly make a difference over time. First, their NFL-team-themed cans, while not a new idea, should drive volume. Home town fans will support their NFL team by buying such cans, not only at the stadium, but for tailgating parties, barbecues or simply because loyal fans enjoy a beer at home. How can you have a get-together to watch your favorite NFL team without serving beer in your favorite teams’ can? 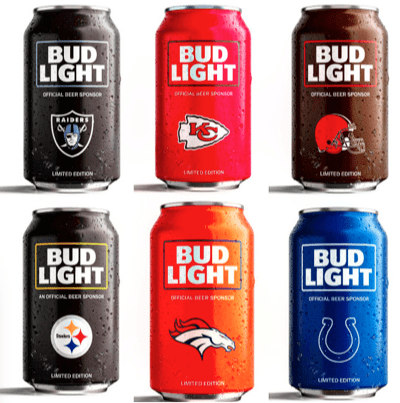 Logo beer cans will be manufactured for all but four NFL teams. As smart as the NFL sponsorship is, ABI has gone one step further. In recent years many colleges have gone wet in their football stadiums and basketball arenas, making beer available to all attendees, including LDA students. The students are going to drink anyway, why not make some money by selling them beer at the event? A recently announced commitment between with AB and Texas A&M is similar to the transaction between AB and the NFL. AB will now be able to produce and display signage and logos on campus and near campus pubs, plus, AB will receive the media rights, and probably scoreboard logo rights for A&M. Not only will ABI have access to these young LDA students, given the political and social environment of the U.S. today, one might expect the lowering of the legal drinking age to 18 or 19. This puts AB in a prime position to market their products directly to these young college consumers. Expect a land rush by AB and MC to sign a plethora of major colleges, especially in the five powerhouse conferences. This is the type of marketing that crafts are not eligible in which to play. While crafts own the social media, AB and MC will own the sponsorship channel, and over time, it will make a difference in the amount of revenue generated. You’ll never lose a game if your opponent doesn’t score…. The west coast has always been the incubator of trends for the United States, and this, of course, includes trends in the beer industry. Crafts got their start on the west coast, predominantly due to that area’s favorable laws, and as some will point out, the mild climate of that area. Expect the next big trend in the beer industry to appear on the west coast as well. It just works that way. So what will be that next industry trend? If we knew what that trend would be, we would all probably be living in Palm Springs playing golf. Perhaps the next trend in beer is not beer! Maybe it will be marijuana. How the legalization of weed will affect the beer sales has yet to be determined. Most industry pundits are predicting a negative impact on beer sales, however, it is too early to make any such prediction. What is clear in the early days of legalized sales is the dramatic impact on state budgets. Oregon recently legalized the sale of marijuana for 2016. Initial projections for the first two years of legal sales were $18.4 million dollars, however the total revenue collected between January 1 and July 31 is more than $25 million! This is due, in part, to the fact that the Oregon medical dispensaries that sell recreational pot, started collecting a 25% tax on their sales. In January alone, that amounted to $3.48 million in taxes. The tax revenue collected is supposed to pay for police, addiction programs and schools. The amount of tax revenue collected really has a positive effect on all Oregon beer sales, and one must believe that this tax will, especially in the early years of marijuana sales, take pressure off the beer industry for any tax increases! Even with the marijuana-driven tax revenue increase for the state, Oregon has passed legislation to double the amount of deposits collected on all bottles and cans. Oregon was the first state to implement a deposit law of five cents per container. The Portland beer wholesalers created CRINC, a company owned by the wholesalers, to collect, process and sell aluminum and glass. Even at five cents redemption, CRINC was a profitable company. Now, doubling that deposit fee, one has to believe CRINC will be substantially more profitable. The redemption rate of containers sold is below 100% which provides a cushion to cover costs. It will be interesting to see if containers come in from California, Washington and other states for redemption. What happens if the redemption rate goes to 105%+? The impact of marijuana sales on beer sales is yet to be determined, however, early signs are positive for the beer industy, at least in the aspect of any new beer taxes. Either way, these trends on marijuana sales and increased container deposit has begun on the west coast and will definitely be moving east. Trends are headed east. It will not be long, get ready. Competition is the keen cutting edge of business, always shaving away at costs….